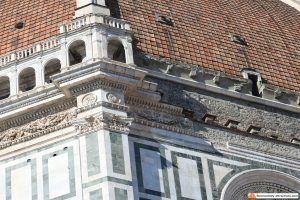 When people get to see Florence Cathedral decoration, they are amazed by the level of detail in the green, pink and white marble covering. 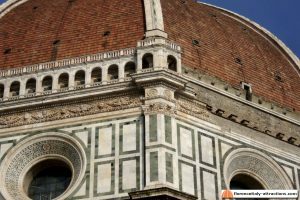 They’re also attracted by the huge Brunelleschi’s Dome, the greatest achievement of architecture in that incredible period that was the Renaissance. Only some of them notice that actually, part of the decoration is missing: it is in the tambour (the walls sustaining the dome), where only one of the eight sides has a complete decoration. Why was it left unfinished? 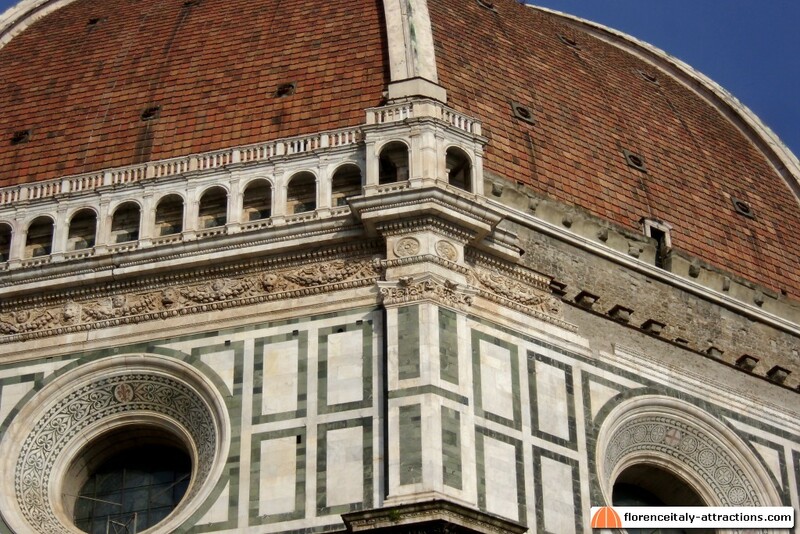 Brunelleschi’s dome was completed in 1436, but actually it was still missing the keystone, which was also designed by Brunelleschi. It’s the octagonal building on top of the dome, where tourists love to climb to enjoy a great view of the city (after having been in line for a while and after having climbed 463 steps). Then came the golden sphere with the cross on top, a work by Andrea del Verrocchio, helped by his young apprentice Leonardo Da Vinci. Now the only missing part was the covering of the tambour, which was assigned to Baccio d’Agnolo in 1506. At that time, Florence was filled with artists, the best in history like Michelangelo Buonarroti, Leonardo Da Vinci and Raphael Sanzio: Michelangelo, in particular, was a rockstar in town, given that just two years before he had completed his statue of David; Leonardo was painting his Monna Lisa, while Raphael was trying to learn something observing the two older artists. Baccio d’Agnolo designed a gallery similar to a loggia, which had to embrace the dome along his eight sides, all made of white marble, contrasting with the red roof and with the multi-colored decoration below. After finishing the first of the eight sides, Baccio d’Agnolo wanted to know what the Florentine people thought about his job. It was not a good idea, especially because Michelangelo was in town and his opinion was taken in high consideration, as he was considered the greatest artist of the Renaissance. Imagine Michelangelo in the square, observing the new Florence Cathedral decoration for long minutes, with many people waiting for his words… Finally, he scratched his beard and, in a typical Florentine way, he made everybody else aware of his opinion saying: “looks like a cage for crickets”. Baccio d’Agnolo was a sensible artist, he felt offended by those words and decided to abandon the job. 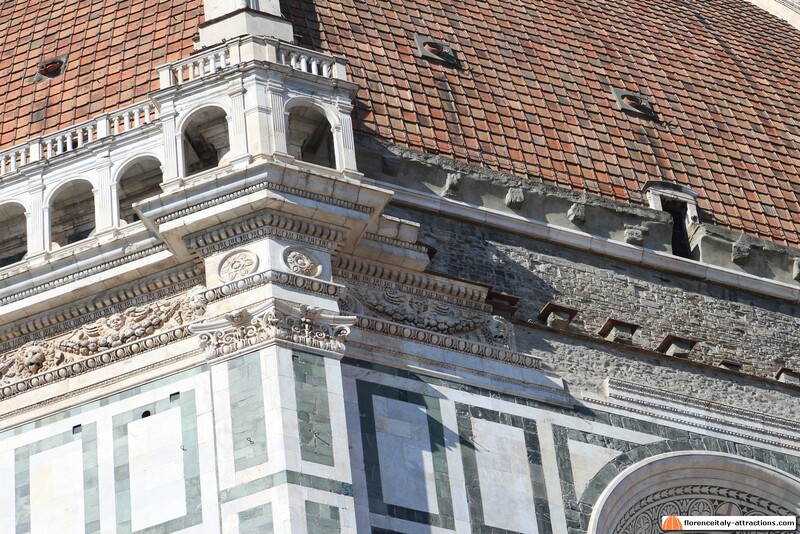 No other artist dared to continue working on Florence Cathedral decoration, and that part of the church remains unfinished, as we can still see today.